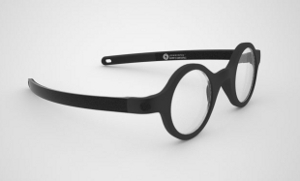 Innovative prescription eye glasses that do not require Optometrists, by Adaptive Eyecare. A solution for the third world where Optometrists are only available in big cities. 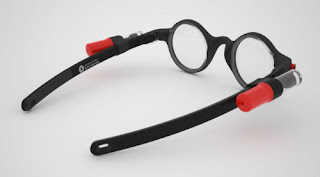 These glasses are similar to the original self-adjustable, fluid-filled eyeglasses developed by Professor Joshua Silver. 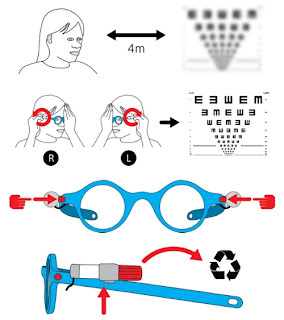 The adjuster is removed once the glasses are calibrated. These frames are mostly made for teens between 12 and 18, correcting only Myopia between 0 and -5D. Step 1 Place the vision chart at a distance of minimum of 4 meters. Step 2 Cover one eye, at the time and calibrate the side arms till the chart is clear. Step 3 Press the front, sealing button, to seal the presciption in place. Step 4 Remove the adjusters & can now be used as normal glasses. 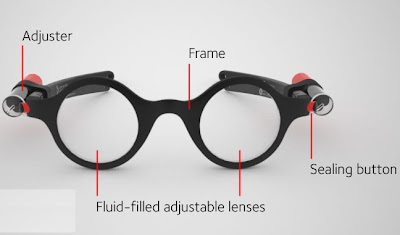 Side view illustrates the side adjusters that are used to calibrate the glasses. The glasses seen without the adjuster containers. 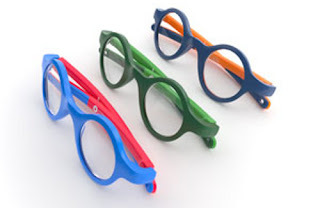 Glasses in different colours to make them more appealing to young people.